With Adobe Reader X (10.1.1) can access, print and create PDF files. Adobe Acrobat Reader X is a global electronic standard for viewing, search, sharing documents, digital signing, verifying, printing and creating PDF files. 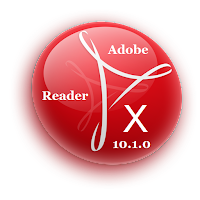 What can you do with Adobe Reader X? With Adobe Reader X 10.1.1 you can open and interact with any type of PDF file, even if it contains forms or multimedia content. Also this version includes Adobe AIR! Among the top features of specific features of Acrobat Reader X, it includes access to all PDF files, without errors or other problems, it can make annotations and share your feedback by marking PDF documents with "Sticky Notes" and highlighting tools. In addition, with Acrobat Reader X you can enjoy greater security in terms of malicious code, as well as online services such as search, create, share and save documents in safe. - Internet Explorer 7, 8 or 9, Firefox 3.5, 3.6 or 4, Chrome 9.0. You can download it free here: Download!